So anyway, with all those stuff that’s happening (plus a huge bout of laziness), updating the blog was out of my mind for quite some time. But today I’m back! 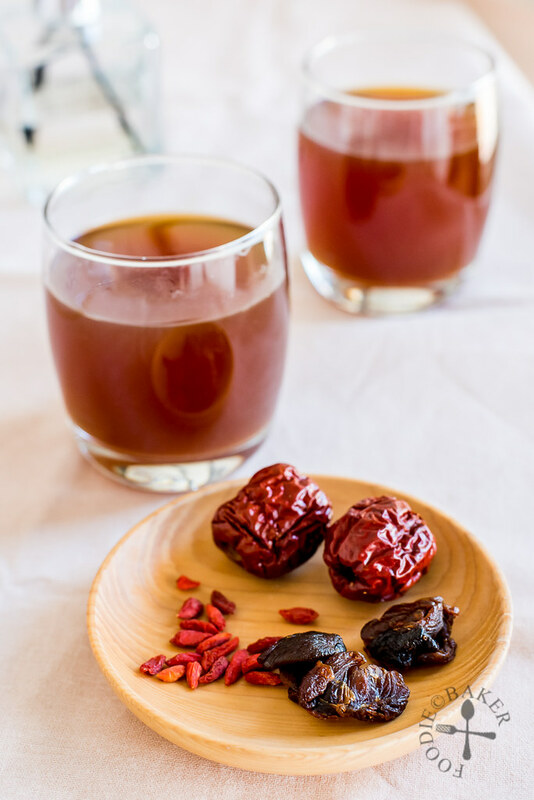 With a recipe that I made and photographed while I was still back overseas – Red Date Longan Tea with Goji Berries. 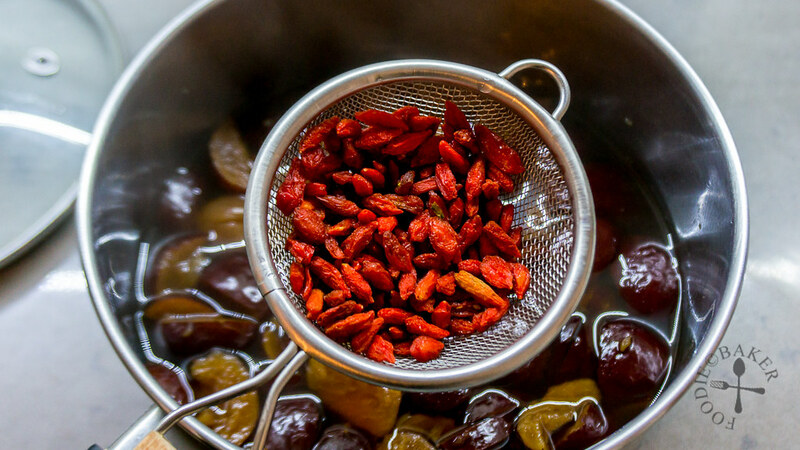 Dried red dates (also known as jujubes) and goji berries (also known as wolfberries) are some of the most popular health foods in Asian cuisine. 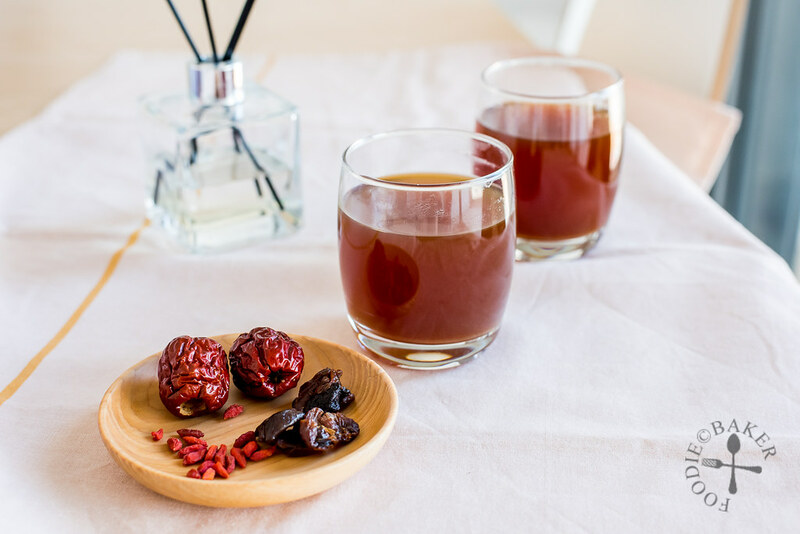 According to Traditional Chinese Medicine, red dates can help protect the liver, lower cholesterol levels and boost the immunity system while goji berries are rich in antioxidants and vitamins, help reduce blood glucose, and high in protein and fibre. 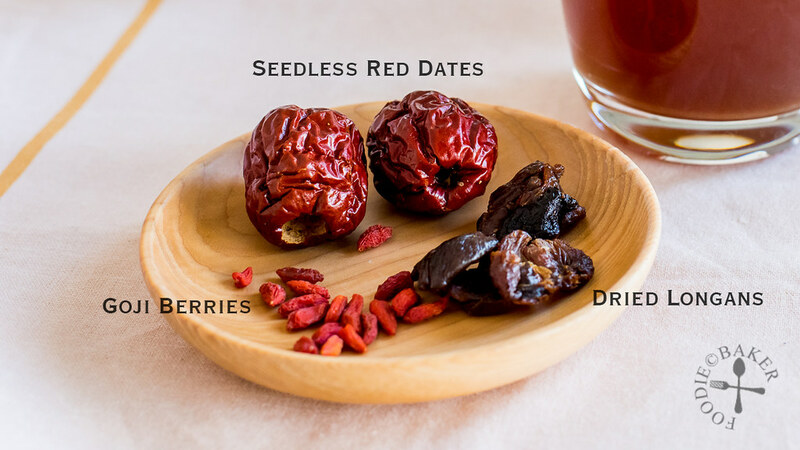 Both red dates and goji berries can be used in sweet and savoury recipes, making them extremely versatile and good to have around in the pantry! 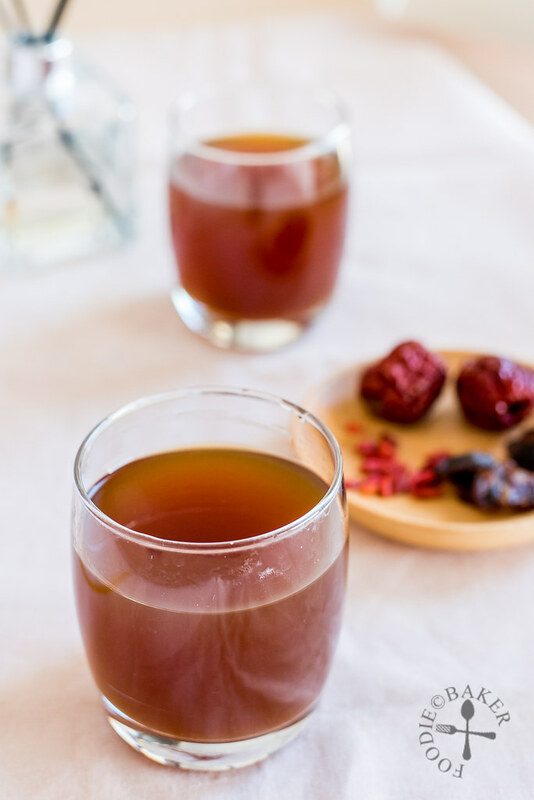 Red Date Longan Tea is a sweet and delicious drink that can be enjoyed hot, warm, at room temperature and even cold. As dried longans are pretty sweet, there is no need for additional sugar. 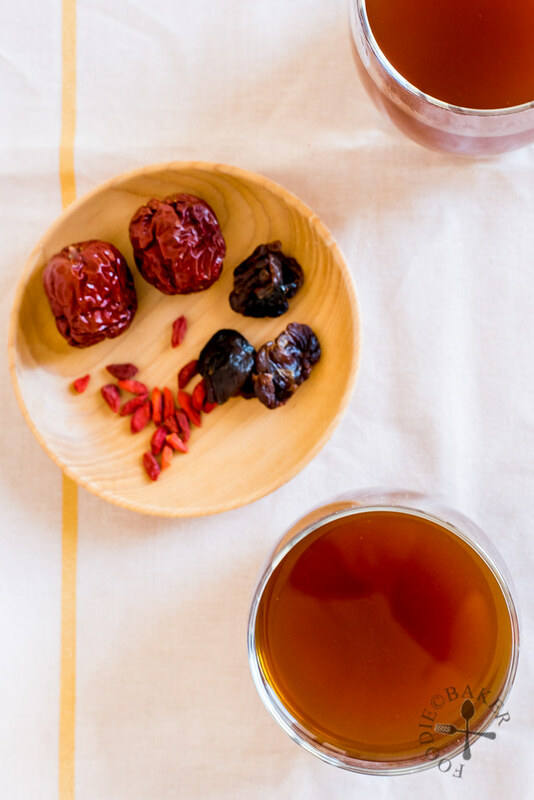 Red dates and dried longans are the only must-haves for this recipe, I only added the goji berries because I happened to have them on hand, You can even add ginger if you like! As mentioned before in my Green Bean Soup post, heatiness and coldness are Traditional Chinese Medicine terms. Consuming too much heaty foods tend to make people fall sick, usually developing sore throat and cough with sticky phlegm. Consuming too much cooling foods may cause fatigue. In this case, red dates and longan are heaty foods. To lower the heatiness of the Red Date Longan Tea, the seeds of the red dates should be removed, and less longans can be used. If you really find the drink not sweet enough, you can add in brown sugar to taste. Besides being a delicious tea, Red Date Longan Tea is also good for skin complexion – so ladies (and gentlemen alike), drink up! Cut the red dates up into small pieces and soak in water for at least one hour – overnight if you have time! 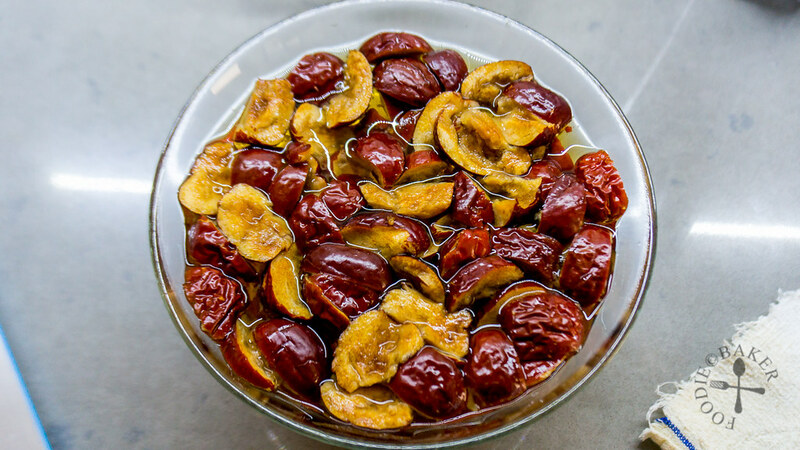 Combine the red dates, the soaking water and dried longans into a pot and cook for 25 minutes. Add in goji berries and cook for another 5 minutes. Strain the tea into cups and enjoy! 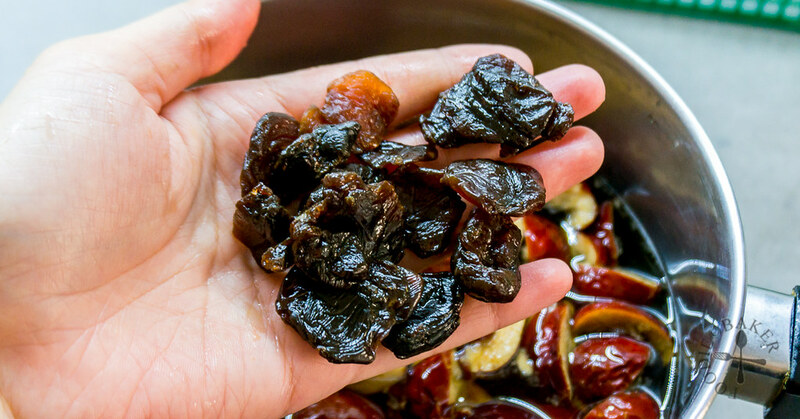 Cut red dates into small pieces and soak in water for at least one hour, preferably overnight. Transfer red dates with the soaking water into a pot. Add in longans. Cover the pot, bring to a boil and simmer for 25 minutes. Add in the goji berries and simmer for another 5 minutes. Strain the tea. Add sugar (preferably dark brown sugar) if needed. Serve hot, warm, at room temperature or cold. - Variation: Add one or two ginger slices in Step 2 and simmer together with the red dates and dried longans. - It's important to use seedless red dates to reduce the heatiness of the drink. Longans are also heaty, so use less or drink less of the tea if you are feeling heaty. I purchased 2lbs of longan when I was in Thailand recently. I’m hooked on the tea now! I’d like to try the addition of goji and red dates. I can find goji, but I’m not sure where to find red dates and more longan in the US. Are they items I should get online or look in an Asian market? Thanks. Followed your recipe and made a pot for myself. It taste great! However, I forgot and threw away the red dates soaking water. Does the soaking water enhance the taste of the tea? I had the red dates in water for 24 hours and this wasn’t placed inside the fridge.. I’m now wondering if it’ll go bad? Hi Lme! Do you find the dates and the soaking water smelling weird? If not I think it should be ok! You are welcome! Hope you like the drink! Wow you have been so busy, no wonder you’ve had no time for blogging. Good luck with everything and I look forward to more when you have the time. I hope you had a great Christmas and you have a very happy and productive New Year! A nice cup of your tea will be nice while you contemplate your new kitchen design. I wish you all the best in the New Year. I hope you’ll find some good job. Singapore s a beautiful country. I wish I was there again. Have a good Christmas time. Beautiful images and lovely recipe! Why do you soak the jujube fruit for an hour before boiling?